Bali diving is some of the best in the world! Located in the heart of the coral triangle, recognised as one of the foremost areas of marine biodiversity in the world, Bali offers a huge variety of dive experiences, with great conditions all year round. Water temperatures are generally kind, and visibility normally great (12-40 metres). From big, coral covered wrecks to small critters, cruisy coral explorations to ripping drift dives, from mantas to Mola Mola, your Bali dive experience with us will be wondrous. Many of our guests start their diving journey in Bali, a perfect place to complete your PADI Open Water certification with a variety of stunning dive sites very suitable for beginner divers. 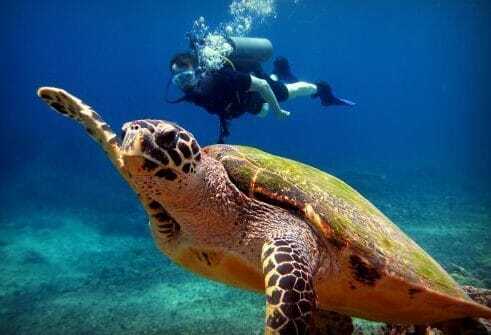 For certified divers looking to visit Bali, Nusa Penida and Candidasa can present some tricky currents which can make diving there thrilling and increase your chances of seeing the big stuff like sharks, Mola Mola, and manta rays. Whilst our company is fresh, with fabulous new equipment, we have been diving in Bali for over 10 years. We have great knowledge of currents and conditions, and where to find the good stuff! We focus on providing our guests with an amazing and personalised Bali dive experience, taking the time to make sure you’re comfortable, confident and supported by our team. Have a look below at some testimonials from our previous guests. We feel great to be certified open water divers and definitely look forward to dive more in bali and do the advanced course with of course Mr Amin. He was a great teacher and made our dives more fun. Everything on our dive trip with Intrinity divers was sorted out and efficiently managed. It was an amazing experience to dive at Manta point in Nusa Penida. I would gladly recommend anyone going to Bali to make their dive with Intrinity divers! We did our Junior Open Water course with Amin and Rachel when we were 10 and 12. We loved the dives, seeing lots of cool fish and corals. They were really nice and made the whole course lots of fun. Now we dive together all around Bali with our parents and friends. I have dived with Rachel a number of times, so when my son turned 10 I had no hesitation in asking Rachel to be Charlie’s instructor for his Junior Open Water course. Rachel was fantastic with Charlie. Both with coursework and in the water. Charlie had so much fun with his course and Rachel was a massive part of that. Charlie has gone on to love his diving. We owe a massive thank you to Rach for all she did and helping Charlie to enjoy his first step on his Scuba diving ladder. I’m so glad I decided to do my Advanced Open Water Diver course with Rachel. She is such a kind and amazing person and a very professional and patient instructor. I do recommend her to anyone who looks for a very personal Bali dive experience with a lot of laughs and fun. You will feel welcome and well looked after from the first second. Hope to dive with her again very soon. We dived in Bali with Rachel shortly after our Open Water certification and did our Advanced Open Water course with her. She had a lot of patience and made sure we understood every bit of the theory. She always looks out for safety first and provides great gear, she would never take a risk that puts you in danger. She comes with a lot of experience and calm and you can feel this throughout the dive which gives you a great experience. We saw a lot of great dive sites and she always looked out for us. Can’t wait to dive with her again. I did my PADI Open Water Diving course with Rachel. I had one on one lessons with her when I was 14. She explained everything I needed to know in a way it was easy to understand and she answered all the questions I had. I would definitely recommend her especially for children that want to learn to dive. She was great fun! Best diving school ever. I felt very safe and well cared from Rachel and Amin. They show you nice places and are responsible divers. Every time we did a dive, they collected plastics in the water – love that, thanks Rachel! We so enjoyed doing our Advanced Open Water in Bali with you – thanks for getting us through it so professionally! Fabulous photos! I would highly recommend intrinity divers to anyone who wants to go diving from beginner to professional or even a snorkel trip. I had an amazing time diving with intrinity divers. I spent two months in Bali doing an internship with intrinity. I complete my advanced open water, rescue and divemaster course. I also decided to do my nitrox certification with them. Intrinity always goes the extra mile to make the customers feel safe while having a lot of fun diving and also to be environmentally friendly but bringing reusable bottles. And most importantly always have snacks! My husband and I dived yesterday with Intrinity divers and it was one of the best dives we’ve done. Amin was our guide and he was amazing, always smiling, helping us with every single thing in the boat and of course he always made us feel safe. During the dive we saw some amazing coral formations and some manta rays swim around us. Amin took some amazing photos and sent them the same day. I would highly recommend this dive shop and all its staff. Thank you for and unforgettable experience. 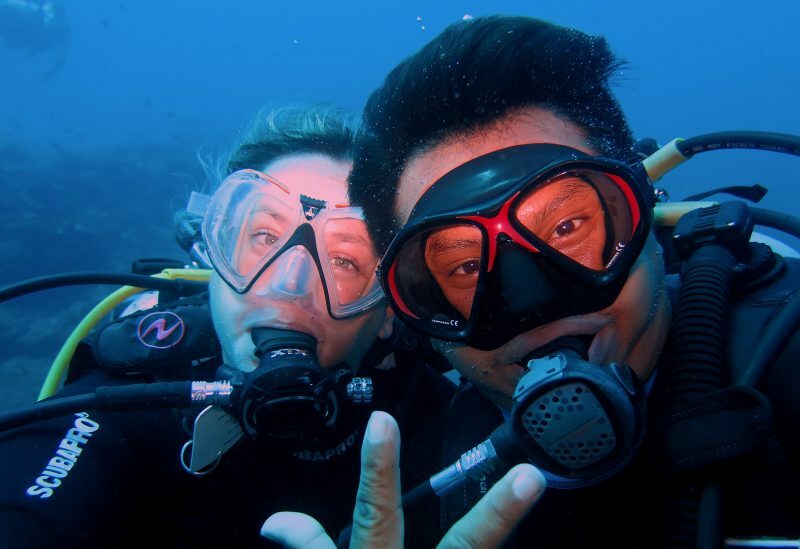 I had such an awesome time diving with Rachel and Amin. I did a dozen of dives with them in Amed, Tulamben, Kubu and Padang Bay. Rachel took me out for a one day trip to Nusa Penida including 3 dives. She took great care of me and showed me all the amazing spots. Definitely my best diving experience so far. She also took her camera and shot unbelievable pictures and videos of me with the mantas, turtles and sea life. (Check it out on their FB page). Thank you very much for this amazing experience. Intrinity Divers is highly recommendable! I had the pleasure of diving with Intrinity divers in August and was very satisfied with the professionalism. Everybody there is very welcoming and make you feel very warm and comfortable. On our dive we were fortunate enough to see a number of turtles which we were all ecstatic about. Looking forward to coming back and doing more dives them!